Students from Harriet Tubman Middle School on the N Flint Ave bridge yesterday. Their classrooms are just 50 feet from freeway lanes. Tubman Middle School Vice Principal Lavell Wood speaking to parents. This is the meeting that should have taken place before two students where hit. 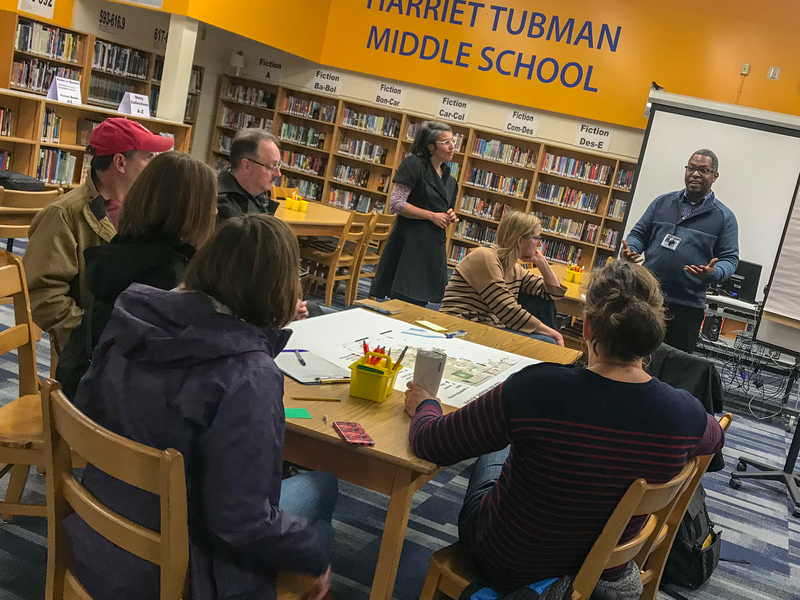 On Tuesday, Harriet Tubman Middle School officials and bureau of transportation staff met with parents who are concerned that their children will be run over by automobile users while walking and biking to class. Tubman sits on Flint Avenue, a busy driving route that’s the main access to the Broadway Bridge. One block northeast is the wide and fast intersection of North Russell Avenue and Vancouver. 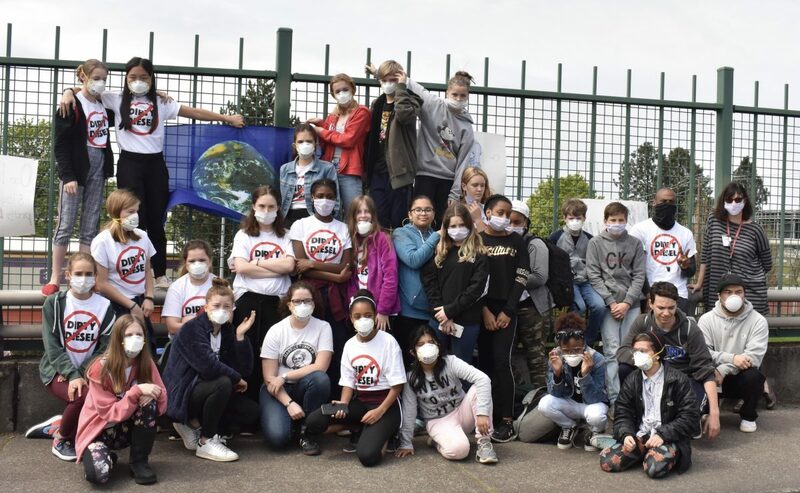 Interstate 5 — and all its associated hazards — is literally in the school’s backyard. 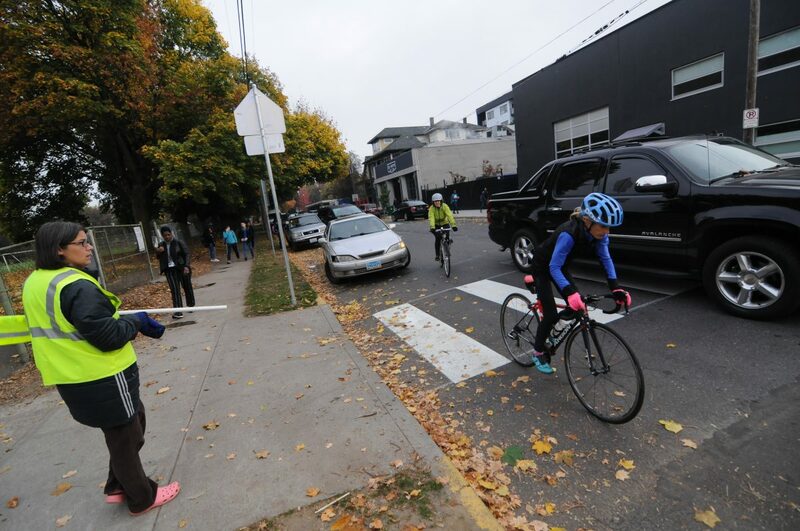 Bicycle and car users stream down Flint Avenue as a Tubman Middle School crossing guard watches. No one was surprised when a sixth-grade student was hit by a car driver while crossing North Flint at Russell near Harriet Tubman Middle School last week. Both times in the past three years that this school has re-opened to students, attempts have been made to educate the public about the traffic chaos that takes place in front of the school each day during drop-off and pick-up. This year the site houses a middle school and observers say conditions are worse than ever before. And as reported in more detail by The Oregonian this week, parents had flagged dangerous conditions on Flint for months prior to the opening of school. Looking southbound on N Flint at Russell. The school is on the right. Many of us had bad feelings about the chaotic traffic on North Flint Avenue during school drop-off. Now those concerns appear to have been very warranted. 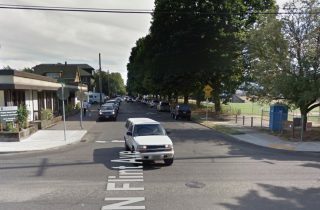 Less than two months into the school season, a young student walking to class was injured by an auto user as she crossed the street in front of Harriet Tubman Middle School yesterday morning.